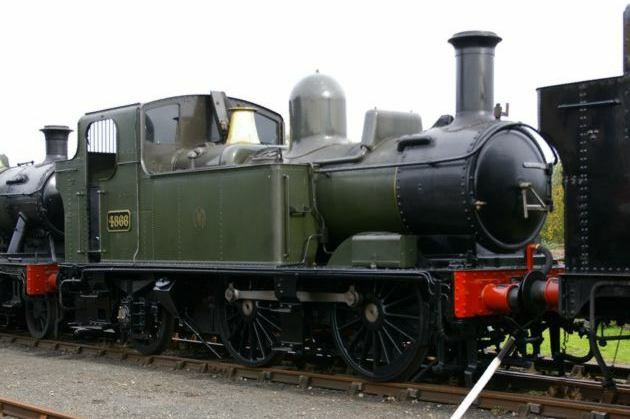 These are actually of the nominally Collett 9300 class, but the layout is fundamentally similar on all the classes with two outside cylinders. This page is not intended to discuss the workings of the gear, nor the implications of the relationships of the components. Its simply to enable the reader to identify and name the key parts. Component names used do vary, especially in US practice, but those used here are consistent with late GWR and BR(W) usage. This shows the reach rod and the piston valve and external rock arm. Both are connected to transverse rods which transfer movement to and from the components inside the frames. The reversing shaft goes across the frames and activates both sets of valve gear, (and there is no reach rod on the left hand side of course) but the rock shafts and rock arm assemblies are on both sides of the locomotive and independant of each other. The gear is controlled by the relative position of the expansion link and the expansion die block (also called the link block). The die block and the extension rod are hung from the link hanger, and move forward and back. 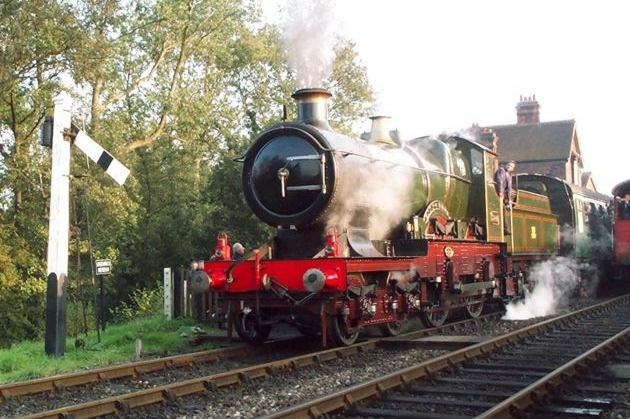 The expansion link is suspended from the arm on the reversing shaft by the lifting link, and is moved up and down when the locomotive is put into forward and reverse. The eccentrics cause the expansion link to rock to and fro. In mid gear the die block is in the centre of the expansion link, and experiences much less horizontal movement so insufficient motion is transferred to the extension rod to open the valves to admit steam. In full forward gear only the forward eccentric rod controls extension rod movement, and in reverse gear the die block is at the lower end of the expansion link and only the reverse rod contributes to extension rod movement. When the position of the expansion link is intermediate between mid gear and full gear then the locomotive is "linked up",and the movement of the extension rod is reduced and affected by both eccentrics. There are numerous sources for descriptions of the functioning of Stephenson's Link Motion. For a practical introduction to the motion (and almost everything else) on GWR Locomotives "GWR Two Cylinder Piston Valve Steam Locomotives" by E.J. Nutty is a valuable text and includes an excellent isometric drawing showing the parts in detail. For some more sophisticated understanding of valve gears I suggest Don Ashton's Steam Locomotive Valve gears site, especially in this context the page on Stephenson's gear.